I'm writing this from the Starbucks in the Sapporo Grand Hotel. When I arrived, there was already another Rubyist here. Five minutes before, I met another one walking down the street. Last night, I went into a Sapporo bar, and a speaker was there, and soon after, I saw yet another Rubyist passing by, and called him to join us. This kind of serendipity is what made Sapporo Ruby Kaigi 2012 such a wonderful conference. My first Sapporo Ruby Kaigi was in 2010. With only about 120 participants, it was much smaller in size than Ruby Kaigi's 700+ people. Despite its relatively small size, the organizers put together a top-notch programme. I felt very fortunate that I could participate in it, as I thoroughly enjoyed being part of a community of such passionate people. When Sapporo Ruby Kaigi 2012 (sprk2012) was announced, the announcement was in both English and Japanese. This was the first time a Regional RubyKaigi had provided bilingual information, but at the time, I didn't think much of it, besides being excited to attend myself. Later, Kazuya Numata reached out to me for help with improving the English communication, I was more than happy to help, both because I had enjoyed the previous one so much, and that it aligned with my goal of making the Japanese Ruby community more international. The Japanese Ruby community has traditionally divided Ruby conferences into international bilingual ones (the Ruby Kaigi), and domestic Japanese only ones (Regional Ruby Kaigi). A big part of this is the language barrier. As most Japanese Rubyists are not comfortable in English, they want to talk about Ruby in Japanese. Because they worry that non-Japanese Rubyists would not enjoy a Japanese language conference, all previous Regional Ruby Kaigi have had no English information. With sprk2012, the organizers went all out with internationalization. Two of the three keynote speakers were from outside of Japan. About a third of the other speakers were. Ten percent of the attendees were. As much as possible, the conference was bilingual. I'm really glad that people from all over the world were able to enjoy sprk2012, and am thankful to the organizers for making it an international Regional Ruby Kaigi. 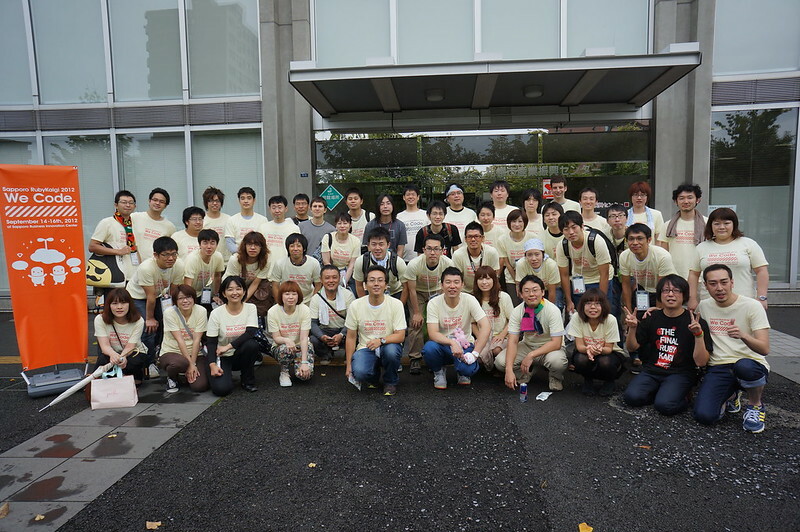 I hope other Regional Ruby Kaigi are inspired by sprk2012 and try to be a bit more international. There are many non-Japanese Rubyists who are looking for an excuse to travel to and around Japan, and Regional Ruby Kaigi are a perfect opportunity. However, without any English information, even those who speak some Japanese are unlikely to find out about Regional Ruby Kaigi, so even having a little bit of English would go a long way. One good example of how this could be done is Tokyo Ruby Kaigi 10, and I would be happy to help any other Regional Ruby Kaigi similarity accessible. The international nature of the conference seemed to tie in with one of the themes that emerged at sprk2012: diversity. Presenters encouraged technical diversity (Matz's "One size does not fit all"), involving more women in the Ruby community (Rails Girls), and more cross cultural communication (Yoko Harada's "Why Don't You Go To Conferences In US?" and try :english). Diversity is one thing Japan has traditionally lacked, so I'm glad to see that the Ruby community sees it as a priority. Thank you to all the organizers of Sapporo Ruby Kaigi, you made it a really memorable experience. I'm already looking forward to the next Sapporo Ruby Kaigi.